Brand-new championship to feature representative drivers from every K1 Speed location around the world. Challenge GP-style race to produce Location Champion and State Champions. State Champions invited to participate in the K1 Speed World Championship finale held at Irvine. K1 Speed World Champion to receive $15,000 cash prize! With over 40 locations across the world and growing, K1 Speed has solidified itself as the ultimate electric indoor karting experience in the industry. This success has led to an incredible expansion with K1 Speed’s International Franchise Program, which has created K1 Speed locations in Mexico, South Korea, China, and Canada with more to come in Panama, Kuwait, and Puerto Rico over the next 12 months. 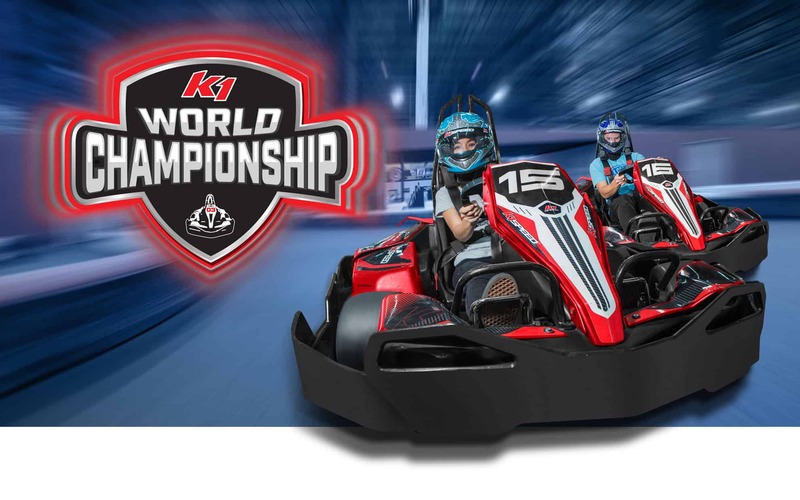 This worldwide expansion has influenced K1 Speed’s decision to ramp up the K1RS points competition and take our internal competition to new heights. In 2019, one exceptionally talented racer will be crowned K1 Speed World Champion. Each K1 Speed location will determine their “Location Champion” which will be determined by a Challenge GP format. To qualify, each racer will need to be a minimum of 14 years of age and to possess at least 4,000 K1RS points by the end of the year. Every racer starts with 1200 points at the beginning of the calendar year. Each Location Champion will then be invited to participate in the State Championship at a center within their state. The US Championship will be at Irvine, in a K1NG of Speed-style format that will determine who the fastest racer is. The final event the following day will include the US Champion versus our champions from the other countries that host a K1 Speed location. The challenge will be a tournament of three different Southern California K1 Speed tracks, each done as a Challenge GP race. The racer with the highest points at the end of the competition will become the inaugural K1 Speed World Champion! The top three finishers of the World Championship will be awarded with incredible cash prizes: $15,000 for first place, $7,500 for second place, and $3,500 for third place. In addition to the cash, other amazing prizes will be rewarded including products from K1 RaceGear’s current lineup. Those interested should start racing at their nearest location to earn points and practice for the opportunity to partake in this amazing international competition, the largest of its kind and with the biggest money purse to win! “Location Champion” to be determined by a Challenge GP race format to be held at local K1 Speed. State Championship will be determined at a center in that racers state. “State Champion” invited to World Championship finale at Irvine to compete for the US Championship. US Champion will compete against other Country Champions for World Championship in a tournament of three different K1 Speed locations in Southern California. For any questions, please email [email protected]. **NOTE: This page has been updated. Due to permitting and zoning of K1 Circuit taking much longer than anticipated, we have had to revise the format of the championship. Therefore the World Championship finals will have an alternative race format listed here. State Champions were determined within the state to help keep costs down for our racers. We apologize for any confusion or inconvenience as a result.